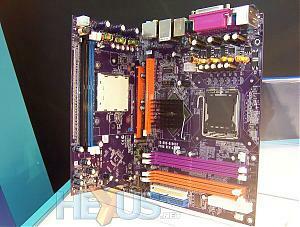 AMD &INTEL---ON THE SAME MOBO. HEXUS has pictures of a snazzy board from ECS...both a64 939 and a LGA775 socket on the same board, the former conecting via a pci-e daughterboard. No, you cannot multi-process with bothcpu's for now, but it may only be a matter of time. The converter features a SiS756 chipset to utilise the AMD K8 architecture, and is so new, it has no name, not even a codename at the time of writing. The mainboard has 4 slots for DDR2 667, a 1066FSB, SATA2, GigaLAN and 1394a Firewire. When in place, the SiS965 Southbridge is shared with the converter card which is based around AMD socket 939. The card has it’s own dedicated SiS756 Northbridge, 2 slots of DDR400, power management circuits and a FSB2000T. These are all needed to run the AMD K8 technology. LOL. This is like the third thread that has been started about this. LoL really? oops. that's what i get for not having internet for the weekend...i'm late! Interesting, but why exactly does anyone need the ability to use either make of CPU if they cant be used together? because AMD is better for single threads, while a p4 with hyperthreading is good for multi threads...work and play on the same board, instead of 2 different machines. With the new dual cores can't you do the multithreading stuff with the 939 now? There's some flash presentations on the dual-core gubbins there.